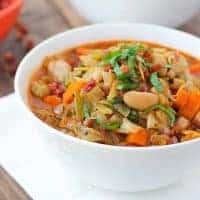 I like making a double batch of this soup and freezing some in quart-sized mason jars for a quick, healthy meal later. To do this, make sure you don’t fill the jar all the way and let it cool completely in the refrigerator before freezing. I definitely prefer pancetta for this soup, but you can use bacon if you can’t find it. In a large dutch oven, heat the olive oil over medium-high heat. Add the pancetta and cook until browned and crisp, about 6-8 minutes. Using a slotted spoon, remove the pancetta and place it on a paper towel lined plate to drain. Add the carrots, celery, onion, and a pinch of salt/pepper to the pan. Cook over medium heat until softened, 8-10 minutes. Add the garlic and tomato paste to the pan and cook until fragrant, about 30 seconds. Add the thyme, bay leaf, and chicken stock. Bring to a boil then reduce to a simmer. Simmer for 10 minutes. Add the drained beans and artichoke hearts and cook for another 10-15 minutes. Before serving stir in the fresh basil. Serve topped with the reserved pancetta. Enjoy!